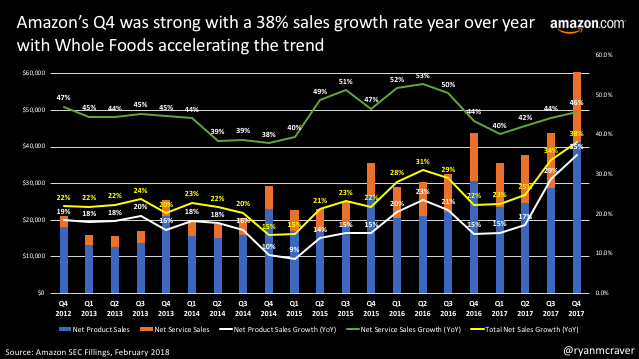 Amazon Numbers: "Thank you Whole Foods"
Growth Accelerates: Top line revenue growth was 38% of which Services and Product Sales grew 35% and 46% respectively. The Shift is On: The shift to brick and mortar continues as stores now account for 8% of sales and online accounts for 54%, down from 68% last year. Services, Services, Services: Growth including AWS was phenomenal...and profitable. Nothing to worry about here. 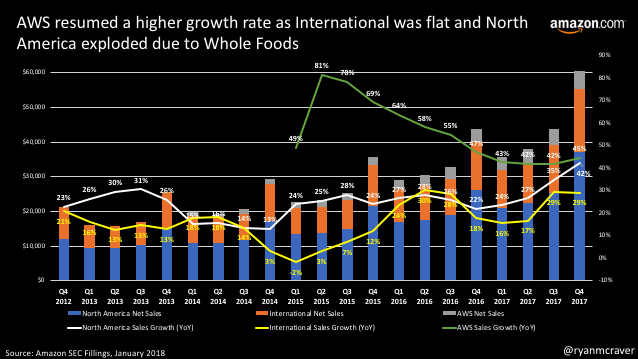 However, as the effects of the Whole Foods growth disapears after 2 more quarters, international will need to ramp further to maintain the 30%+ growth rates investors are accustomed to. Updated charts below.